Why did I make such an expensive business card? Finding a job is tough. Even if you’re a perfect fit for a job, it doesn’t guarantee that you’ll get an interview, let alone get you the job. Searching google for “how to get a job as *insert job title here*”, will result in a million of pages giving you advice on how to get the job you want. Well, this post is going to make it 1,000,001, even though the point of this blog post isn’t a tutorial on how to get you a job. But the main point of this blog isn’t for marketing, it’s to document my projects. A few years ago I came across a cool project, the Arduboy, a credit card sized Game Boy powered using Arduino. I liked the idea behind the Arduboy, and they added a lot of functionality for their kickstarter, but I had one major issue with it, it wasn’t mine. That’s the problem with makers, we don’t like buying products, we get our joy from making them. I didn’t care if it wasn’t as good, it was about doing it myself and customizing it to my liking, and so the Arducard was born. 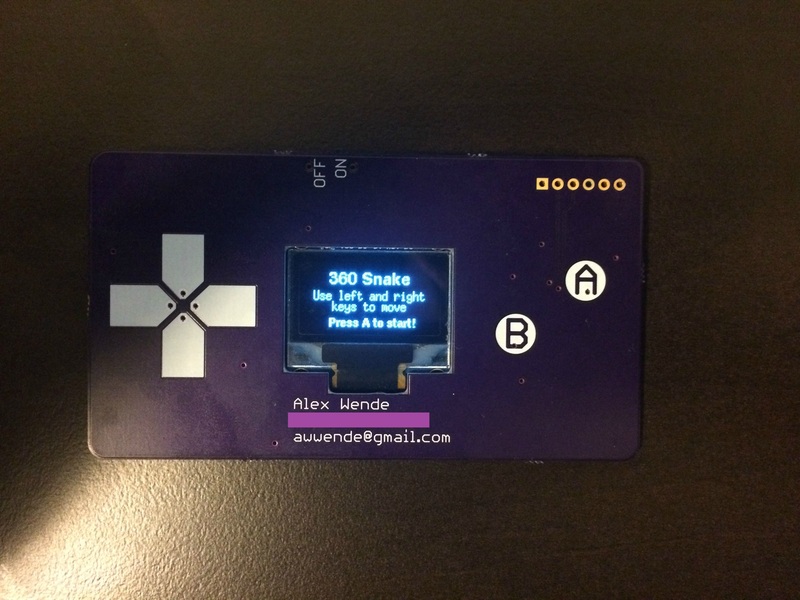 The Arducard uses a capacitive touch sensor for classic Nintendo controls a low power OLED display for the screen. The controls and display are connected to the ATmega328P and everything is powered from a single CR2032 coin cell battery with a 3.3V boost converter to regulate the power coming out of the battery as efficiently as possible. Below is the full schematic, and here’s the github repo with the Eagle files, and source code. You can play just about any game that uses less than 30kB of flash and 2k of RAM, but I opted for Snake 360, it’s a classic game, and it’s difficult enough that it makes the player want to keep playing, and the whole time they’re playing, they’re starring at your contact information. I wasn’t a fan of the layout the Arduboy used, clearly they placed the screen and the buttons to match the original Game Boy, but given the small size, I thought it was important to move the buttons to the either side of the display to make it more comfortable, which is also why I rounded the corners over after I placed my order for the second revision of boards. I used to mill layer to cut out a rectangle the size of the OLED screen, this along with the inverted silkscreen over the A and B capacitive touch buttons, a nice clean look. One of the things I was most surprised with was the battery life. In the first revision, I just had the battery connected to the 3.3V rail. I ordered a microcontroller to operate down to the last 10% of battery capacity, but overlooked the forward voltage drop that’s used for the display, which is why I added in a boost regulator. On the first revision, battery life was only about half an hour before the screen stopped working. After the boost regulator, I was able to get 10+ hours of game play before the coin cell needed to be replaced. This was one of the projects where I wasn’t looking for a job when I made it, but now that I have a few, when I do go to interviews in the future, it’s something I’ll make sure to have ready to hand out. Of course the major down side to this business card is the cost. I was able to build one of these for around $25, way more expensive than your typical business card. But when you want to stand out, it’s certainly worth it’s weight in gold. Awesome project Alex! Keep up the good work! Any chance you can share a breakdown of the components you used in a more readable format (and their respective costs)? I added a table below the schematic with the BOM and price break down. Hopefully as I get used to wordpress I’ll be able to make the table a bit more pretty, WP doesn’t seem to like having style tags in the HTML code. It appears though that MPR121 (used for the capacitive touch sensing) has been discontinued. When I have some free time, I’ll have to find a good replacement and update the schematic and BOM with updated information. where can i buy one? I’m not planning on selling the business cards, but the project is open source! 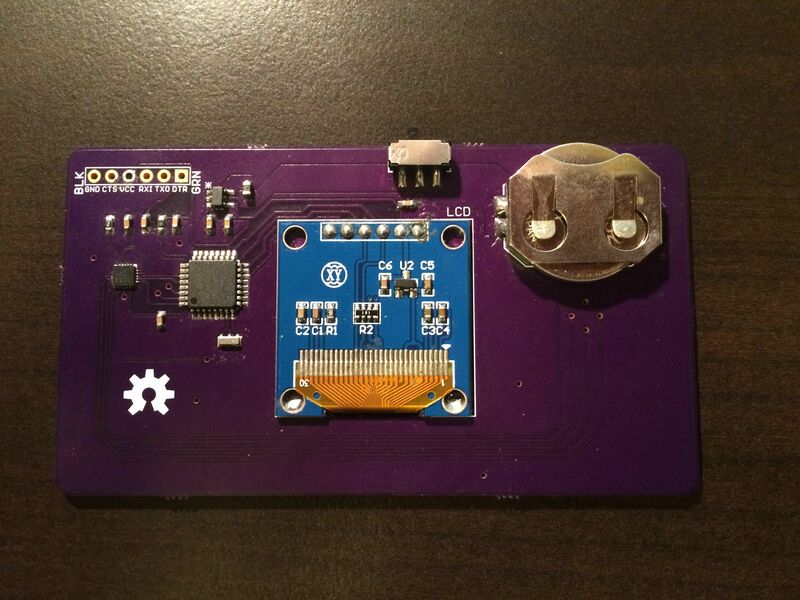 You can view the Eagle PCB files and Arduino code here: https://github.com/awwende/arducard.